A large number of cats will develop problems with their kidneys later in life. Kidney disease causes irreversible damage to the kidneys which means that the organs will lose the ability to efficiently filter waste products from the blood. Blood and urine tests carried out by your vet will indicate if your cat is suffering from either acute renal failure (ARF), which comes on suddenly, or chronic renal/kidney disease (CKD) which develops over a period of time. A cat with kidney problems can continue to enjoy a good quality of life if appropriate treatment and support is given. Regular check-ups and medication are essential in treating this disease. Your vet may also advise a special kidney diet for your cat. Maintaining a good fluid intake. Feeding a diet with low protein content. Restricting the phosphate content of the diet. Commercial diets designed to help manage renal failure are, therefore, both protein and phosphate restricted. While kidney disease has no cure, the zooplus range of speciality dietary foods can help to reduce the workload of the kidneys although you should always ask your vet for advice before changing your pet’s diet for medical reasons. Integra Protect Renal is a specially designed food for cats with limited kidney functions. Zooplus can also recommend the Beaphar Special Kidney Diet. Don’t forget, zooplus offers free delivery for all orders over £19.00! 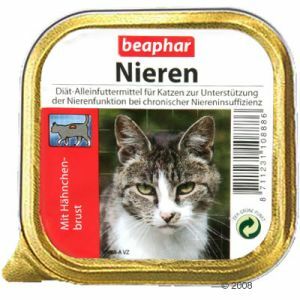 This food is really great, it helped my cat who had severe problems with the liver. She is so much better now with the Beaphar Special Kidney Diet. I definitely recommend it! My knowledge is that cats should have a high protein diet and low carb diet which reflects their natural diet in the wild. A lot of commercial diets contain a lot of carbs which cats aren’t able able to process. All very confusing. Hi Leanne, You are right that cats, being obligate carnivores, normally need a high protein content in their diet but protein break down can produce harmful toxic substances in the blood which a cat will not be able to filter out if the kidneys are failing. Special Kidney Diets should not cut out protein completely but the lower levels do help to reduce the work-load on the kidneys for older cats. Consult your vet straight away if you think your cat may have any of the symptoms of kidney disease or you would like advice on correct feeding for specific health problems.